On Wednesdays this last spring, teenage members of the Sedro-Woolley Boys & Girls Club were given the opportunity to participate in a special Cooking Club. 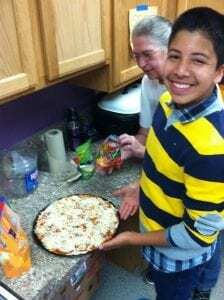 Thanks to the efforts of volunteer Patricia Stephens, and the Helping Hands Food Bank, the Woolley Teens learned how to make a variety of unique, interesting, and often, healthy dishes. Some of the dishes they created included homemade pop tarts, using jelly and pie crust, and spaghetti made with squash. They were shown how to make homemade pizza and introduced to bread pudding, which most of them had never even heard of before, but now love. Great programs like Cooking Club are made possible because of the support of the community and awesome volunteers like Patricia. The Club is extremely grateful for their support. Cooking Club will be taking a short break over summer but the teens are looking forward to its return in the fall.